Developer website: Stellar Information Technology Pvt. Ltd.
Is there a better alternative to Stellar Smart Finder? Is Stellar Smart Finder really the best app in File Management category? Will Stellar Smart Finder work good on macOS 10.13.4? 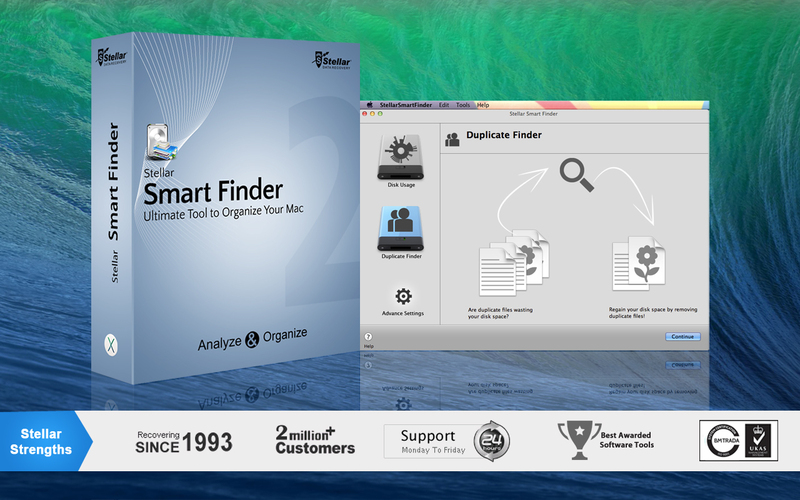 Stellar Smart Finder is a great utility that helps you in locating and sorting files in your Mac. In addition, you can get details about its size, creation date, and other attributes. The software has two impressive modules: Disk Usage and Duplicate Finder. The file path is shown in three styles: Sunburst View, Column View, and List View. Note: Although Finder and MacUpdate Desktop do not report a version number for this app, the developer claims it is version 2.0. Stellar Smart Finder needs a rating. Be the first to rate this app and get the discussion started! Many times, it happens that we save several duplicate instances of a file in more than one location. Gradually, it results in low disk space. Finding and removing the duplicate files manually can be very tiresome. The Duplicate Finder option in Stellar Smart Finder helps in searching for all such files and deleting them so that you regain valuable disk space.